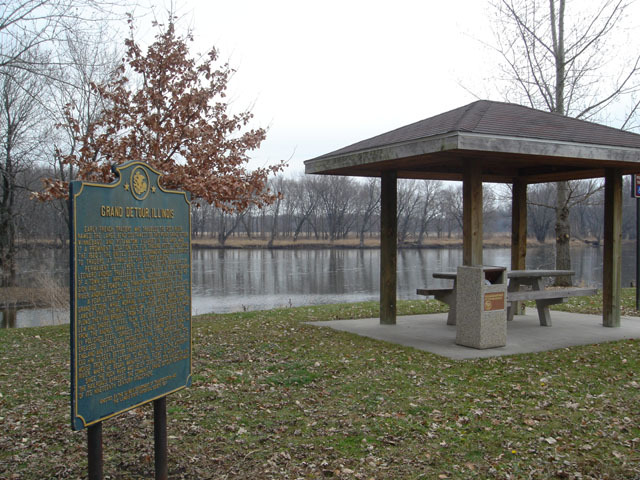 Located south rest area Idge Rd and Route @ Grand Detour IL Coordinates Lat N 41 53.762 " Lon W 89 24.750 "
Early French traders who traveled the Rock River named the large bend southwest of this point, Grand Detour. Winnebago and Potawatomi villages in the area made it a prominent location for fur trading posts, and during the 1820's the United States Government granted licenses to traders at 'Grand Detour on Rocky River.' 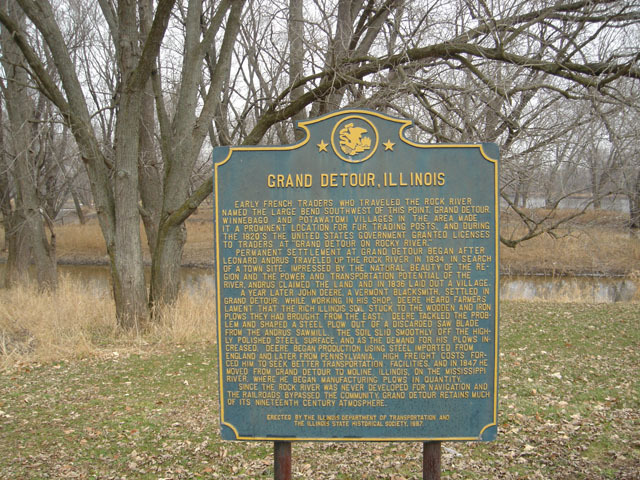 Permanent settlement at Grand Detour began after Leonard Andrus traveled up the Rock River in 1834 in search of a town site. Impressed by the natural beauty of the region and the power and transportation potential of the river, Andrus claimed the land and in 1836 laid out a village. A year later John Deere, a Vermont blacksmith, settled in Grand Detour. While working in his shop, Deere heard farmers lament that the rich Illinois soil stuck to the wooden and iron plows they had brought from the East. Deere tackled the problem and shaped a steel plow out of a discarded saw blade from the Andrus saw mill. The soil slid smoothly off the highly polished steel surface, and as the demand for his plows increased, Deere began production using steel imported from England and later from Pennsylvania. High freight costs forced him to seek better transportation facilities, and in 1847 he moved from Grand Detour to Moline, Illinois, on the Mississippi River, where he began manufacturing plows in quantity. Since the Rock River was never developed for navigation and the railroads bypassed the community, Grand Detour retains much of its nineteenth-century atmosphere.